An artist’s concept of a near-Earth asteroid flying close to Earth. A mountain-size asteroid will zoom past Earth Monday (Jan. 26), marking the closest pass by such a large space rock until 2027. 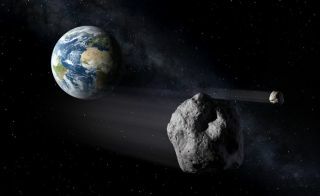 Asteroid 2004 BL86, which is about 1,800 feet (550 meters) wide, will come within 745,000 miles (1.2 million kilometers) of our planet Monday — about three times the distance between Earth and the moon. While this flyby poses no threat to Earth, it does present a rare opportunity to get a good look at a near-Earth asteroid, NASA officials say. "For objects that get this close, that are this large, the radar observations are really analogous to a spacecraft flyby in terms of the caliber of the data that we can get," said Lance Benner of NASA's Jet Propulsion Laboratory in Pasadena, California, who is the principal investigator for the Goldstone observations of the asteroid. The resulting black-and-white images can reveal unprecedented details about asteroids, whereas most ground-based telescopes would see only a point of light. But the first item on the team's checklist will be to nail the space rock's location in space and time. This will enable a better understanding of the object's orbit and its future motion, scientists say. Even though 2004 BL86 poses no threat to Earth for the foreseeable future, it's still a good idea to keep a close eye on the asteroid, Benner said. "Really, it's an inexpensive form of insurance to monitor these objects on a regular basis," he told Space.com. Benner also postulates that such work will benefit commercial companies that plan to visit and mine asteroids in the future. The researchers expect to obtain resolutions as fine as 13 feet (4 m) per pixel, so the images of 2004 BL86 should reveal details as small as the length of a typical car. This will allow the scientists to assess how rugged or smooth the space rock's surface is. "It's expected to be one of the best radar-imaging targets of this calendar year," Benner said. If Benner and his colleagues get enough images as the object spins, they can start to reconstruct its three-dimensional shape in order to understand how it rotates. They also plan to search for any moons in tow. About 17 percent of asteroids in 2004 BL86's size range tend to have smaller objects trailing along with them. The Goldstone antenna will track the asteroid for 5 to 6 hours most nights from Jan. 27 to Feb. 1. The Arecibo Observatory, however, will only be able to spot 2004 BL86 on the night of Jan. 27. Its radar is not fully steerable, and the space rock will be zipping through the sky at 2 degrees (roughly four times the width of the moon) per hour. "The thing that excites us the most is that we don't know anything about it, but it's likely that we'll learn a great deal and see a lot of detail," Benner said. "Whenever one of these objects comes really close like this, it offers such an outstanding opportunity — we almost always see things we haven't seen before. And so we're expecting some kind of surprise." You can watch 2004 BL86's flyby in visible light (as opposed to radar observations) live online Monday via the Virtual Telescope Project in Italy. Editor's note: If you capture a telescope view of asteroid 2004 BL86 during its flyby and want to share it with Space.com, you can send images and comments to managing editor Tariq Malik at: spacephotos@space.com.